Toxoplasma gondii or T. gondii, a brain parasite that infects about one in three people, may contribute to the development of Alzheimer’s and other brain diseases, according to a new study co-written by Dennis Steindler, director of the Neuroscience and Aging Laboratory at the Jean Mayer USDA Human Nutrition Research Center on Aging (HNRCA) at Tufts. The study, the work of 32 researchers from 16 institutions, was published in September in Scientific Reports. The results show that the parasite alters certain genetic pathways in neural stem cells—the very ones that are involved in Alzheimer’s, Parkinson’s, epilepsy, brain cancer, and a host of other neurodegenerative diseases. Steindler and others have long suspected that infectious diseases might target brain cells, but this study has allowed scientists to zero in on the specific mechanisms involved, paving the way for further research. 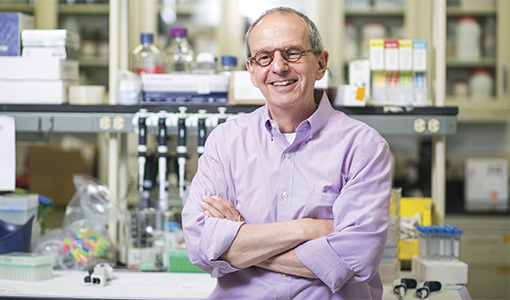 “By studying this disease and its potential connections to others, we can find trends and common pathways, and use it as a way to try to prevent and treat them all,” said Steindler, whose lab focuses on the combined use of stem cell, regenerative, and integrated medicine therapies for debilitating neurological diseases and injuries. T. gondii can infect people who ingest materials that have been contaminated by the parasite, such as undercooked meat, drinking water, or cat litter. Most people never know they have been infected, but others may develop flulike symptoms or more severe reactions. Steindler said some of the scientists who worked on the study are looking into formulating a vaccine for T. gondi, while his lab is continuing to explore other factors that lead to neurodegenerative disease. “You need a perfect storm of components to get these diseases,” Steindler said, pointing to risk factors that include pollution, radiation, and inadequate physical or mental exercise. But Steindler is particularly interested in the role of chronic tissue inflammation, and how to mitigate it through a diet high in fresh fruits, vegetables, and fish, and low in carbohydrates. “We are finding that good diet and nutrition are an extremely important component in disease prevention and delay,” Steindler said.